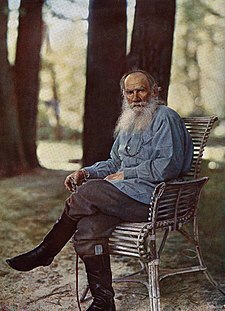 Tolstoy photographed at his Yasnaya Polyana estate in Mey 1908 bi Sergey Prokudin-Gorsky. Count Lev Nikolayevich Tolstoy (Roushie: Лев Никола́евич Толсто́й, pronounced [lʲef nʲɪkɐˈlaɪvʲɪt͡ɕ tɐlˈstoj] ( listen); 9 September [A.S. 28 August] 1828 – 20 November [A.S. 7 November] 1910), an aa kent as Leo Tolstoy, wis a Roushie novelist, short story writer, filosofer an playwricht who primarily wrote novels an short stories. This page wis last eeditit on 13 Mey 2018, at 00:37.